Castillo Beach Bungalows is a 2 star accommodation complex ideally located just outside the centre of the resort of Caleta de Fuste. The complex offers a slightly quieter stay than in the town centre as it is located in a residential district just up on a hillside. The bungalow apartments were designed by the artist Sergio Calvo and have all the modern necessities required for a perfect self-catering holiday. Within the complex there is a swimming pool and children's' paddling pool surrounded by a sun terrace with loungers and parasols and a snack bar is close by. Also on site there is a bar and restaurant serving international food. 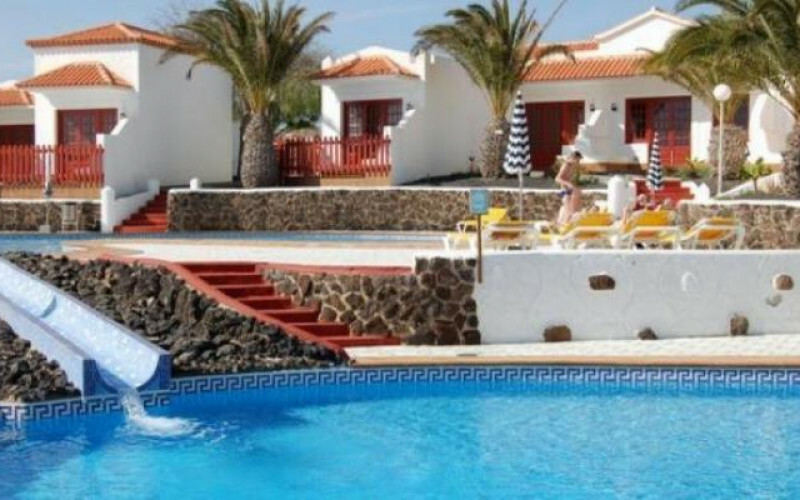 Even though the bungalow complex is situated just outside the resort you are only 1km away from the marina and the beautiful sandy beach of Playa del Castillo along with all the water sport activities that are available there. A 10 minute walk down the hill will get you into the centre of Caleta de Fuste where you will find supermarkets, a cinema and a good selection of bars, restaurants, shops and other holiday entertainments. For the golfers you are only 1.5km away from two 18 hole Golf Clubs making the bungalows ideal for a golfing getaway. The complex consists of 90 bungalows each sleeping up to 4 people. Each bungalow has a bedroom, bathroom, fully equipped kitchen and living area with a sofa bed. Outside there is a private patio area. Stone pathways lead you to each of the bungalows which are built in the typical Canarian style. For your convenience there is also an on-site laundry as well as a multi-purpose sports court and small gymnasium. Castillo Beach Bungalows is an ideal base for your holiday giving you access to a great range of holiday activities and excursions - in all a great choice for families, golfers or those travelling on a budget.